California Office of Environmental Health Hazard Assessment (OEHHA) - Mission is to protect and enhance public health and the environment by scientific evaluation of risks posed by hazardous substances. See section on Fish and Fish: San Francisco Bay and Delta Region. Got Mercury? - This online tool takes the mystery out of which seafood is safe to eat with regard to the presence of mercury in certain species of seafood and allows consumers to make informed choices about eating seafood. Gauge your mercury exposure from eating seafood with this easy-to-use tool. Local and Regional Fish Advisories - California's OEHHA guidelines on fish consumption. See site-specific information for SF Bay Area here, other areas in California here. Bibliography: Estuarine Contamination from Varied Human Influences - SF Bay and Delta - USGS. Chemical Contamination in San Francisco Bay (1995) - California Office of Environmental Health Hazard Assessment (OEHHA). Conceptual Model of Mercury in San Francisco Bay (01/16/2006) - Prepared by Tetra Tech, Inc. for Clean Estuary Partnership. Consumption of Contaminated Fish - Public and Environmental Health Advisory Board, Contra Costa County. Contamination of Fish from the Bay Poses Health Threat to Those Who Catch and Eat Them - The Green Gate. Legacy Mercury in Alviso Slough, South San Francisco Bay (1993) - U.S. Geological Survey Open-File Report 2007-1240, 98 p. McBride, G.B., Vant, W.N., Cloern, J.E., and Liley, J.B.
Mercury Contamination from Historic Gold Mining in California (May 2000) - USGS, Charles N. Alpers and Michael P. Hunerlach. Mercury Strategy for the Bay-Delta Ecosystem: A Unifying Framework or Science, Adaptive Management, and Ecological Restoration (12/31/2003) - Final Report to the California Bay Delta Authority, James G. Wiener et al. Mercury Concentrations in the Blood of Breeding Waterbirds (10/2007) - From Tideline. Mercury concentrations in the blood of breeding waterbirds approached and surpassed toxic threshold levels in the South San Francisco Bay, especially for fish-eating terns. Bird samples were analyzed for mercury at the USGS Davis Field Station Mercury Lab. Mercury Contamination in Waterbirds Breeding in San Francisco Bay (Summer 2007) - From Tideline, the newsletter of the San Francisco Bay National Wildlife Refuge Complex. Mercury Toxicity Categories (10/2007) - A USGS and USFWS graphic from Tideline, the percentage of the breeding populations of several waterbird species that are at risk of reduced reproductive success and declining populations due to mercury contamination in the South San Francisco Bay. Methylmercury in Sport Fish - Information for Fish Consumers (06/2003) - California OEHHA. Overview of San Francisco Bay Sport Fish Contamination and Response Activities (08/1999) - California EPA and California OEHHA. Public Health Advisory for Fish and Shellfish from Tomales Bay, Marin County (10/2004) - California Office of Environmental Health Hazard Assessment. Safe Eating Guidelines for Fish and Shellfish (03/09/2007) - California OEHHA draft health advisory. Sediment Remobilization of Mercury in South San Francisco Bay (2004) - U.S. Geological Survey Scientific Investigations Report. Sources, Transport, Fate, and Toxicity of Pollutants in the San Francisco Bay Estuary (2007) - Environmental Research. 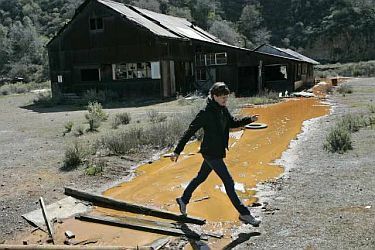 Streams Poisoned by Mercury: A Legacy of Gold Mining - By University of California, Davis researcher Tom Suchanek. Summary of Chemicals of Concern Found in Fish (1994) - San Francisco Bay Pilot study. Water Bodies with Fish Consumption Advisories: An Advisory Map (2007) - California OEHHA. What You Need to Know about Mercury in Fish and Shellfish - EPA advisory. San Francisco Bay Toxics Project - San Francisco Bay receives a broad range of organic and inorganic contaminants that vary widely in their sources, seasonality, toxicity, and environmental behavior. Despite an increasing awareness of potential problems, the effects of organic contaminants in the estuarine environment are not well understood. Since 1991, the USGS has been studying the fate and effects of these contaminants in San Francisco Bay as part of the Toxic Substances Hydrology Program. This study is referenced as the San Francisco Bay Toxics Project. San Francisco Estuary Institute (SFEI): Fish Mercury Project - California Bay-Delta Authority (CBDA) approved a $4.5 million proposal to examine mercury and other chemicals in fish in the Bay-Delta watershed, to increase public awareness of fish contamination issues and to monitor potential changes in mercury concentrations from marsh restoration projects in the Delta. Partners in this project include the San Francisco Estuary Institute, UC Davis, California Department of Fish and Game, Moss Landing Marine Lab, California Department of Health Services, and the California Office of Environmental Health Hazard Assessment. This web site will be a working resource for funders, stakeholders, principal investigators, Steering Committee members, Science Review Panel members and others to follow the progress of this project. Suisun Bay Reserve (Mothball) Fleet - Photo essay by Amy Heiden. "Approximately 1,000 ships have called Suisun Bay home since 1946 and in 1956, the Benecia fleet reached its maximum, 324 vessels. Throughout the years, these ships shed 20 tons of toxic paint into the bay, causing a stir with environmentalists. Samples of the water surrounding the fleet were taken and toxic levels of lead, cadmium and zinc were discovered in the species and water surrounding the fleet. Though these levels weren't significantly higher, they were significant enough that in 2007, the National Resource Defense Council sued the government regarding the issue and in 2010, they won." This webpage last updated on Wednesday, January 6, 2016 4:36 PM.